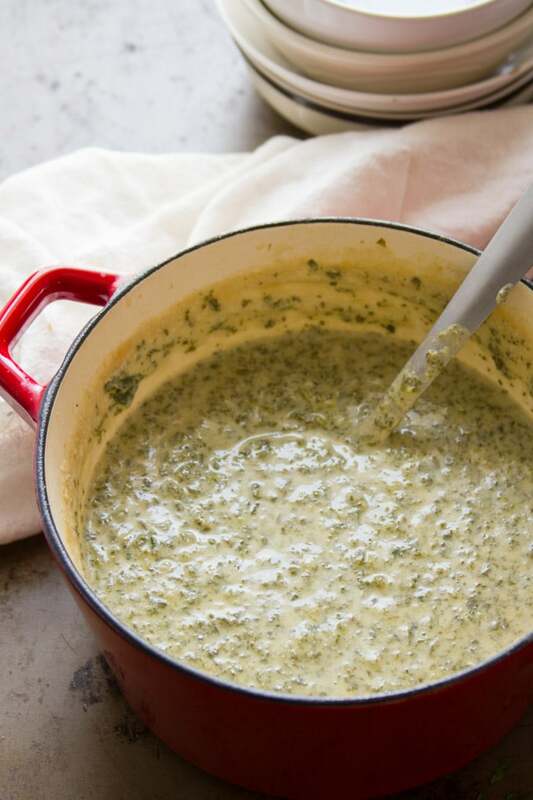 You’d never guess this luscious, creamy kale soup is totally dairy-free! The secret is in a silky base made from raw cashews and just a bit of potato. Top with spicy roasted chickpeas for a bowl of cozy vegan deliciousness! I’m on quite the creamy vegan soup kick lately, having posted creamy cauliflower soup, asparagus soup, and tomato soup in recent months, among others. It’s starting to feel like spring, but still pretty darn chilly out. I’m not ready to let go of soup yet! This is actually an older recipe that I first posted way back in the early days of this blog. It’s a favorite, and I thought it was about time I gave the photos a makeover and the recipe a few tweaks. What makes this soup extra special (besides the creamy, dairy-free deliciousness) is the roasted chickpeas. They’re totally optional, but who doesn’t love a topping with a little flavor and crunch on their soup? Just toss the chickpeas with some olive oil, cayenne pepper and salt. If you prefer a heat-free version, skip the cayenne pepper. 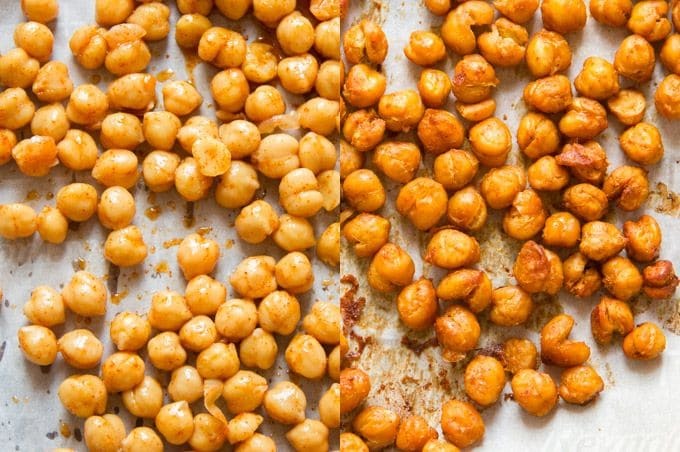 Arrange the chickpeas on a baking sheet and bake until crispy. You can make the soup while the chickpeas roast. The creamy base starts with some cashews and a little bit of potato to thicken it up. (I know, I’ve been using that formula a lot lately, but it works so well!). You don’t even need to soak the cashews: just boil them with the potato, and then blend them up together. In goes the kale. A lot of kale goes into this soup, so you’ll need to add it to the base in batches. Just add as much kale as will reasonably fit into the pot, and simmer for a minute or two until it wilts. Then you’ll have more room for the next batch. Simmer everything until the kale is nice and soft, then blend it again. You can keep it as chunky or as smooth as you like. 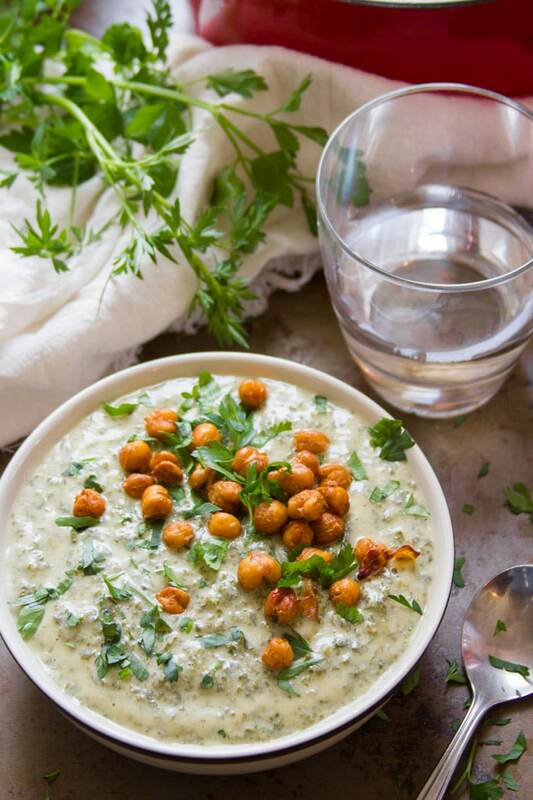 Ladle into bowls, top with crispy roasted chickpeas, and dig in! The roasted chickpeas will keep for a day or two in a sealed bag, but they won’t retain their crispness. Here’s a possible work around: roast just as many chickpeas as you plan on eating. Toss the rest with olive oil and seasonings, but hold off on roasting until the day of serving. If you’re allergic to cashews, macadamia nuts may work as a substitute. I haven’t tested this, but they generally work well as an alternative. If you’re allergic to all nuts, you might be able to increase the amount of potato, and use less broth and more non-dairy milk. Make sure your non-dairy milk is unsweetened. Every now and then I slip up and use a sweetened variety in a savory recipe and it always tastes funny. Don’t feel like making the roasted chickpeas? Try topping your soup with some roasted pepitas or sunflower seeds instead. 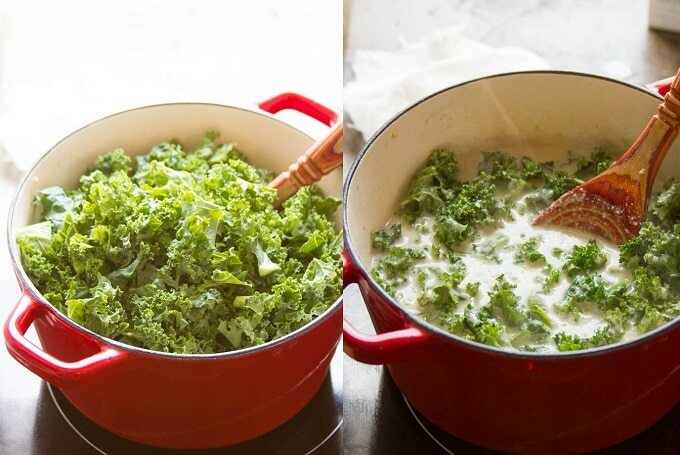 You'd never guess this luscious, creamy kale soup is totally dairy-free! The secret is in a silky base made from raw cashews and just a bit of potato. Top with spicy roasted chickpeas for a bowl of cozy vegan deliciousness! Place the chickpeas, olive oil, cayenne pepper and salt into a small bowl. Stir to completely coat the chickpeas. Arrange the chickpeas in an even layer on the baking sheet. Bake until crispy, about 50 minutes, rearranging them 2-3 times during baking to ensure even cooking. While the chickpeas roast, coat the bottom of a large pot with olive oil and place it over medium heat. When the oil is hot add the onion and sauté for about 5 minutes, until soft and translucent. Add the garlic and continue to sauté for about 1 minute more, until very fragrant. Add 4 cups of broth to the pot, along with the cashews and potato. Raise the heat and bring the liquid to a simmer. Lower the heat and allow it to simmer until the potato is very tender, about 20 minutes. While the soup simmers, prepare the kale by removing the stems and roughly chopping the leaves. Remove the pot with the cashew mixture from heat. 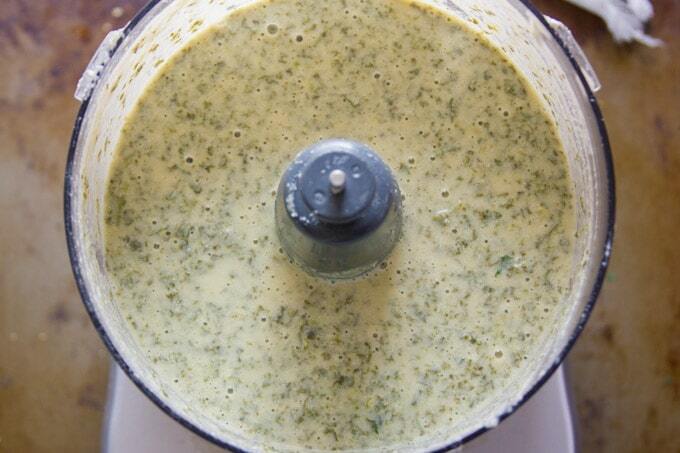 Transfer the soup to a food processor bowl in batches and blend until completely smooth. Return it to the pot. Place the pot back over medium heat and bring the liquid to a simmer. Add the kale leaves in batches, allowing each addition to simmer just until they wilt and you have enough room in the pot to add another batch. Push the leaves down with a spoon between batches. Allow the soup to simmer until the kale is very tender, about 20 minutes. Transfer the soup again to the food processor bowl, working in batches, and blend it to your desired smoothness. Return it to the pot. Stir in the milk and vinegar. Thin with an additional cup of broth if desired, and season the soup with salt and pepper to taste. Heat the soup back up to a simmer. Remove from heat. 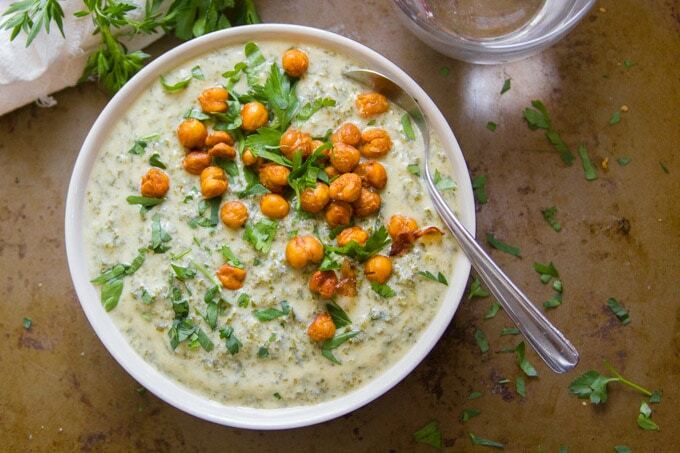 Ladle into bowls and top with the spicy roasted chickpeas. Serve. HOLY MOLY! THIS IS DELICIOUS! Thank you!!! Could this be made with almonds vs cashews? Cashew allergy in the house. I’ve never had luck getting almonds to blend up as creamy as cashews, so I wouldn’t think so. You might be able to get something to work using soy milk instead of broth, but that will probably require a bit of tinkering. How many servings does this make/ people does this serve? How about using peanuts instead of cashews? I’ve find peanuts, even when they’re raw, have a much stronger flavor than cashews, so I think the soup might end up tasting like peanut butter. Macadamias are another option you could try. There is a much easier way to puree the kale. Simmer it in the broth. Then fish it out & puree in a blender with some of the broth. Much faster & much tidier. Don’t like the texture at all nor the extremely bland flavor. Very disappointing. It was delicious! I’ve made it twice already. But I didn’t use the chick peas the second time. It’s good without it. Glad you’re enjoying this one! This soup was delicious! I still have problems getting the cashews to not have a “grainy” look. They didn’t feel grainy when I ate the soup, but I was wondering if I am doing something wrong. I have seen posts where they say to soak cashews anywhere from 20 minutes to 10 hours! Yay!! I’m glad you enjoyed it!! 8 hours usually works best for me. I think the only way to get your cashews perfectly smooth is to use a high-powered blending device, like a vitmix. I actually use a Cuicinart food processor and mine always look a little bit grainy. Also, patience! :) When I’m working on a recipe that I’m going to photograph and I want it to look nice I’ll sometimes let the food processor run for a good 5 minutes. You can also try stopping it for a few minutes, letting the mixture rest, and then blending again. I wondered why don’t you put the kale also with potatos and cashew, etc and blend it only once. Thank you! I’ve never commented on a blog post before, but this is just so good I had to let you know! Eating it right now and absolutely loving it! Thank you! Awesome!! I’m so glad you enjoyed it! Thanks Cynthia! Thanks for sharing this. 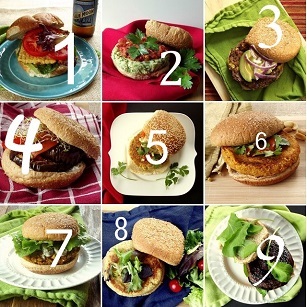 This looks really good and definitely adds onto a variety of alternatives into my diet plan. Thanks Riya! I hope you enjoy it!